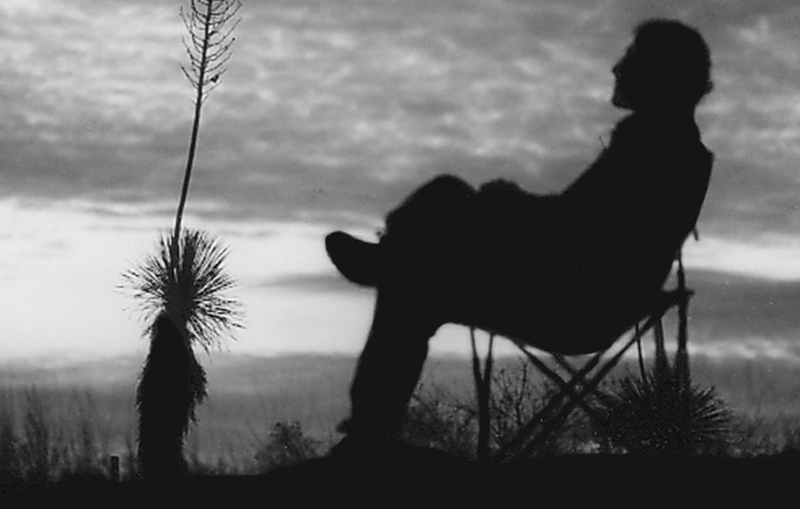 Links at this site will take you directly to an item of interest; or, you can just browse around - Enjoy! 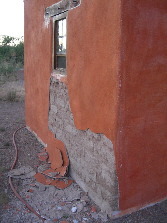 A common problems facing several natural builders in Arivaca is the fact that lime plaster is only staying on the walls 2-3 years. 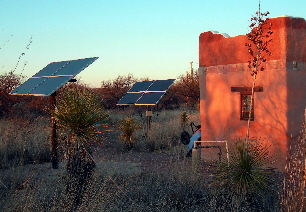 We’re seeing separation of the lime/sand plaster mix not only on natural adobe block walls, but on straw bale and cob (clay/straw) walls also. 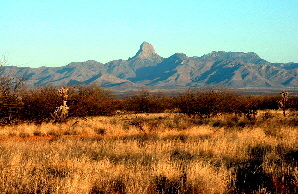 The temperature can swing 40-50 degrees F. every day in Arivaca. Not surprisingly, the south and west walls which receive the most sun are walls seeing a majority of the separation. Getting a formula that works for a Lime plastering mix is as much an art as a science. The natural way is to use an all natural mix with no cement. The reason not to use cement other than it’s a high embodied energy material, is that cement in lime plaster will not allow and adobe wall to breathe. 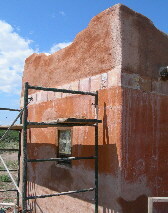 And the resulting moisture between the cement-based lime and the adobe will cause the plaster to separate. We have had some natural builders out of desperation use cement in their lime plaster and the lime plaster still failed within 2-years. Other factors are poor quality of commercially available ‘slacked’ lime and the fact that the air is so hot and dry in the desert, that the applied lime cannot cure properly. The top photo shows failed lime plaster in 2007 from a workshop conducted in 2004 when we were hoping to get it right. The above photo is the patch replastering performed in 2007. To see the 2004 workshop; click on this link: PLASTER WORKSHOP.